High praise indeed, and yet possibly understated, given what is in this new work. It's nearly impossible to overstate what is in this ebook. You may already know Fraser Parker from his contributions to various works by Kenton and his School. For the first time Mr. Parker tips all of his nuances, latest breakthroughs and new advancements in a step by step approach. You can and will do what Fraser himself does when you do as he instructs. Like what? Cause people to be unable to hand you back a deck of cards or other object, keeping them momentarily frozen until you snap them out of their instant trance. No gimmicks. Cause people to be unable to pick up a deck or other object off a table though they clearly struggle to do so, until you release them from your suggestion. Still, no gimmicks. Make people appear temporarily color blind. They can't see a color or they name a color wrong while looking at the color of an object. No trick props or color changing decks here. It's all a matter of words and perception. Touch a forehead or snap your fingers and a person changes their beliefs for life. For instance, someone who says they don't believe in God suddenly swears that they do. They insist this emphatically, claiming this has always been their belief. Mr. Parker's latest work on his stunning effect revealed here. No pre-show. You cannot fail in this effect. Yes, that's incredible. The performer teaches a spectator how to touch someone's head to be able to read their mind. That's exactly what they do, and everyone, including the Mind Reading spectator, is surprised. Nothing written down either. Fraser's impossible take on mental card forcing in which a person really does only THINK of a card, and you name it, or get very close, with no pumping. No gimmicks, visual cues or prompts or anything but the mind and words. Fraser is one of Kenton's incredible students who uses suggestion, wonder words, dual reality, trance influence - real and imagined, and his own special blend of principles to cause these and many other wonders to occur. This is miraculous stuff. It all looks very much like the real thing! Some of it is. Best of all, if you are a student of Kenton's work then you know the importance of principles. Fraser Parker teaches you clearly his use of principles, so you can apply these tools to many other effects in your own performances. This is the stuff of legends. You can do it. You do not have to learn hypnosis, long-winded patter, jerk people around, or anything else of the sort. Fraser even covers any outs if you think you might miss once in a great while, so there is nothing to worry about. 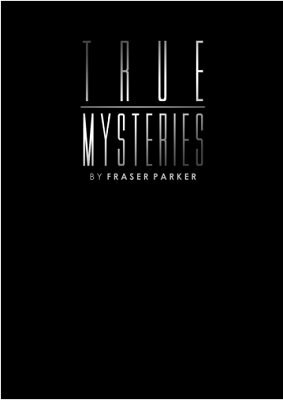 Just do as Fraser Parker teaches and you too can perform these and other true mysteries. Kenton says this book will solidify Mr. Parker's reputation as one of the truly brilliant minds in magic and mentalism. All of this material is very close to the real thing. 1st edition 2011; 40 pages.